Table made of hardwood and flat-cut figured primavera veneers. Mortise-and-tenon frame construction. Handcrafted chairs. Hardwood frame with primavera veneers. Polyester upholstery. Nailhead trim. Mortise-and-tenon frame construction. Sideboard made of hardwood and flat-cut figured primavera veneers. Two doors; four drawers; two adjustable, removable shelves. Doors have inset silver eglomisé stripe decoration. Classic tulip shaping is recast with a vessel grey iron base and a light, burnt oak oval top banded in polished brass steel with exposed nail heads. Handcrafted armless dining chair. Maple hardwood frame. Polyester velvet upholstery. Tapered legs. The curvaceous base of this table supports a top patterned with beautifully grained walnut and maple veneers. With the graceful details of a much-loved antique, these side chairs are versatile enough to fit into both contemporary and traditional settings. Inspired by the beautiful Palladian windows that grace many fine homes in Kentucky's horse country, this buffet combines the beauty of fine furniture with the elegance of traditional architecture. Crafted with tapered legs, curved corners, and subtle hints of brushed brass, this midcentury-inspired piece lends a touch of casual charm to any dining room. Double-pedestal dining table. Made of oak and ash with radiata pine solids. Comes with one 22"W leaf. Oval-back armchairs. Pine frames. Linen upholstery. Elegance meets edge. Plates of stainless steel take on a polished brass tone to welcome nail head detail. A warm slab of oak veneer is wire-brushed to reveal a classic yet fresh parquet pattern and plenty of natural texture. Sleek and stylish with a soft oak finish and neutral linen fabric. Comfortable seating with tufted diamond quilting on back. Featuring plush velvet upholstery, polished brass legs and a plump silhouette worth sinking into, this design recalls a vintage Italian classic, crafted to accommodate guests over lingering dinners. This slimmed-down version features an armless profile and a back brass handle. Trimmed with brass banding and perched on a tapered geometric base, this striking dining table features beautiful marquetry and a central star motif - an of-the-moment combination that elevates contemporary, traditional, and rustic decor schemes alike. With textured upholstery, a brass handle, and well-turned legs, this dining seat brings character and charm to your table. Handcrafted table. Made of gmelina solids and alder wood veneers. Hand-painted finish. Handcrafted dining table. Flat-cut oak veneers. Plank design top. Four turned pedestals and shaped base. Recessed adjustable glides. Handcrafted dining chair. Oak frame. Cotton/polyester upholstery. This sleek silhouette features a rich, cerused chestnut brown finish with subtle hints of gray and white accenting while a sandblasting technique adds texture and depth to the finish. Bronze metal accents on each end provide character and contrast. This sleek dining chair features Crisp lines, tapered legs with a fresh neutral color palette on the fabric with light browns and subtle gray tones with a rich cerused chestnut brown wood finish. The outside back has a ladder back motif for added dimension Save with discounted shipping charges when you order this set; set includes a table, two armchairs, and four side chairs. Open medallions and fluting add interest. Handcrafted of radiatta solids and pine veneers. Chairs have linen upholstered seats. Table has toffee-finished top and linen-finished apron and legs. Dining table inspired by mid-century architecture. 88"W x 40"D x 30"T; includes 22" leaf which extends table to 110"W. Built of hardwood solids with hickory veneers and textured metal corners. Dining chair inspired by mid-century architecture. 25"W x 25"D x 38"T. Frame is crafted of hardwood solids with hickory veneers. Double-doweled joints; corner blocks. Polyester upholstery. Handcrafted dining table. Oak solids and quartered oak veneers. Stainless steel overlay on center pilasters in tarnished nickel finish. Handcrafted glass-top dining table. Rubberwood frame Handcrafted bookcase. Rubber wood frame. One fixed shelf. Handcrafted console with four doors. Center set of doors and both outer doors house one drawer and adjustable shelf each. Rubberwood frame. Embrace modern style but still revere traditional design? Seeking contemporary flair with an appreciation of classic beauty? This graceful, dramatic dining furniture offers the best of both worlds. Save with discounted delivery and processing charges when you order a set. Delicate tufting delivers a classic design touch to modern-minimalist style. Slim metal legs curve in a satin brass tone to support flax-hued high-performance fabric perfect for everyday dining. Handcrafted dining table. Mindi wood solids and veneers. Hand-painted rustic, brushed gray-wash finish. Adjustable metal glide feet. Handcrafted side chair. American oak frame with gray ceruse finish. Cotton/linen upholstery with single welt trim. Striped Grange bench. Handcrafted of striped abaca with scalloped detail over solid mahogany frame. Check Grange side chair. Handcrafted of check abaca with scalloped detail over solid mahogany frame. Handcrafted dining table. Rubberwood and birch veneer. Counter height stool featuring upholstered back. Rubberwood frame. Linen/rayon upholstery. This striking piece features a lacquered frame and a geometric motif of bookmatched marquetry. Bookmatching slivers a piece of wood in two - in this case, striated zebra wood - and lays the pieces face-down in a symmetrical pattern. A simple chair becomes a stylish addition to any table when it features a woven seat in mountain grey bonded leather and stainless steel legs in polished nickel. A woven back brings texture and dimension to the clean-lined simplicity of this leather dining chair. Taupe A simple chair becomes a stylish addition to any table when it features a woven seat in winter white bonded leather and stainless steel legs in polished nickel. Vertical channeling and scallop-like detail deliver depth to neutral high-performance fabric. Exposed framing of toasted nettlewood for a clean, fluid look Featuring a textured chenille seat atop stainless steel legs, the Luna Dining Chair is where plush meets mod. Courtly Check® counter stand. 16"W x 15"D x 25.5"T. Black-finished iron stand. Shelves of hand-glazed, heavy-gauge steel with hand-painted Courtly Checks. Eleven hooks. Steel Courtly Check® counter stand. 16"W x 15"D x 25.5"T. Black-finished iron stand. Shelves of hand-glazed, heavy-gauge steel with hand-painted Courtly Checks. Handcrafted buffet. Quartered oak veneers. Four wood-framed doors with inset antiqued mirror glass panels accented with metal rosettes. One fixed shelf, one drawer with hand-cut out and silverware insert, and one adjustable/removable shelf below drawer behind left pair of doors; ventilation holes and two grommet holes with covers in back panel. Two adjustable/removable shelves behind right pair of doors. Birch cutting board with branded detail. Custom-made, handcrafted steel steak iron. Handcrafted display cabinet. Quartered oak veneers. Two wood-framed doors with lightly seeded inset glass and metal grille. Three wood-framed, adjustable/removable glass shelves with plate groove in frame behind doors. Two puck lights with touch dimmer switch. Two drawers with wrapped pads below doors. 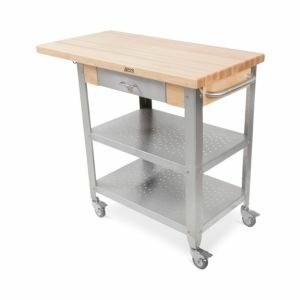 Expand your kitchen work space (and culinary possibilities) with this essential butcher block kitchen cart from John Boos, built to last with signature solid maple top, commercial-grade stainless steel construction and versatile locking caster wheels. Courtly Check Medium Pendant MacKenzie-Childs Courtly Check Barn Pendant Lamp, 18"
Courtly Check Barn Pendant Lamp, 12"
Wood frame chandelier with horn and bone checks. Handmade and hand-painted ceramic lamp with gold lustre embellishments. Brass canopy, cast brass chain, and grosgrain ribbon accent. Includes black silk cord cover and grosgrain bow. Heavy-gauge hand-glazed steel under body pendant lamp with hand painted Courtly Check pattern. Handcrafted hanging lamp. Ceramic, with hand-painted designs and golden accents. Includes brass canopy and cast-brass hanging chain. The comely ripples of these fluted pendant lamps are perfect in a warm, inviting kitchen, by a desk or comfy chair, or as a fresh take on a formal dining room. Sconce made of heavy-gauge, hand-glazed steel. Hand-painted Courtly Check® design. Small Courtly Palazzo chandelier. 22.75"Dia. x 24.5"T; chain, 9'. Enamel and brass. Courtly Check® detail. Silk shades. Handcrafted red mini pendant light. 2"Dia. x 7.25"T; adjustable cord, 6.5'L. Crafted of enamel and brass with Courtly Check detail and cloth-covered cord. Amber Edison bulb included. Chandelier made of enamel and brass. Silk shades. Handcrafted flush-mount ceiling fixture. 15.5"Sq. x 5.5"T. Made of white glass and brass with hand-rubbed antiqued finish. Semi-flush light with Art Deco-inspired design. 20"Dia. x 6"L. Calcite panels. Gold leaf-finished brass. Handcrafted steel caged chandelier with shades. A 21-light Art Deco-inspired pendant with calcite panel framed in gold leaf. Handcrafted transitional jute rug. Tudor Rose rug. Hand-tufted pure wool. Handcrafted transitional sisal rug. Perfect for the kitchen, the mud room, or any room in fact! A Courtly Check® printed canvas border frames this practical, durable sisal rug All natural machine-made sisal rug with cotton edging and latex backing. Recommended for indoor use only. Rug made of wool and sisal. Latex backing.